Gage Goes “Blacksmith” to Kick Off Membership Drive! As the great Martin Luther King, Jr., once said, “No lie can live forever.” This is the reason we continue the fight for truth, assured that one day we shall prevail. 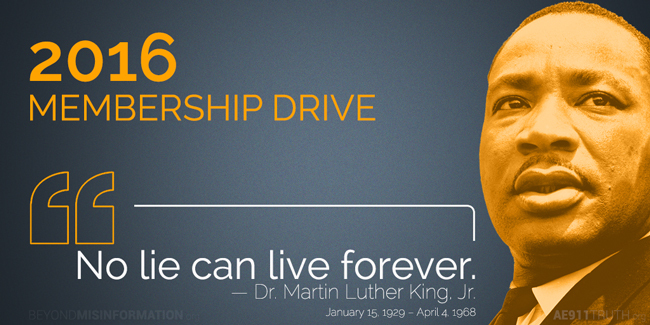 Today, we begin our 2016 Membership Drive. It’s the time of year when we ask every person who believes in our mission to join together to make our important work possible. As you know, AE911Truth isn’t funded by big foundations and billionaires. Because our purpose is to shine a light on the most inconvenient truth of our time — the demolition of the three WTC skyscrapers — we are by necessity an exclusively people-powered organization. In short, we’re the sum of your unified will to expose the truth about 9/11. So please take a moment to reflect on how much this cause means to you. Then give at a level that’s right for you, whether it’s $2.50, $7.50, or higher. It’s not about how much you give, but the fact that you give something. Your investment of whatever size, multiplied by thousands of like-minded supporters, enables us to accomplish so much more than each of us could do alone. One of our priorities in 2016 is to reach more people through short, entertaining, science-based video content. As we saw last month with the infamous “Blacksmith Video” and again last week with our reposted Solving the Mystery of WTC 7 — which received 750,000 Facebook views in just a few days — the number of people that can be reached in a flash is staggering. Today, we’re delighted to introduce a new video that we hope will be viewed by hundreds of thousands — if not more! 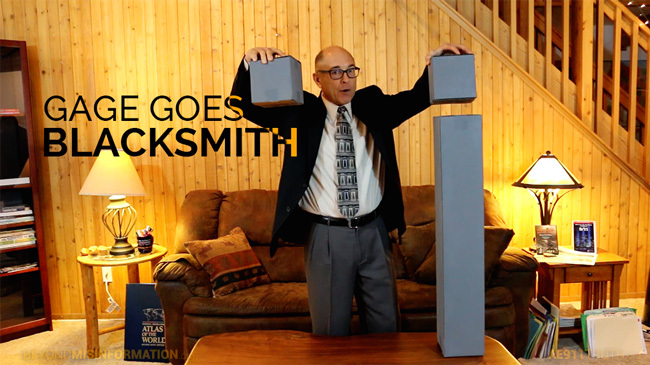 In it, Richard Gage turns the preposterous “Blacksmith Video” on its head, demonstrating why the near-free-fall destruction of the Twin Towers without the use of explosives is impossible. Please watch and share. This year, in return for your generous support as a new member, we’re offering a wealth of eye-opening educational DVDs and written materials that you can share with co-workers, friends, and family. One of the highlights, for those who join at the $7.50 level or higher, is the ultra-popular 9/11: Decade of Deception, a newly-released, two-hour documentary of the 9/11 Toronto Hearings. Featuring such renowned researchers, scholars, and speakers as Niels Harrit, David Ray Griffin, Graeme MacQueen, and Richard Gage, this film showcases more leading voices in the 9/11 Truth Movement than any other. Indeed, seeing sixteen expert witnesses in one sitting is a riveting experience, and is bound to leave a strong impression on any newcomer to the evidence. But Decade of Deception is just one of many premiums we’re offering new members this year. 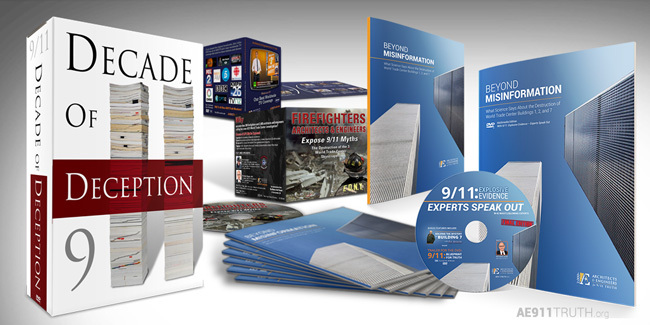 Please visit AE911Truth.org/2016 to learn about all of them and sign up at the membership level that works for you! Our sincere thanks to each of you for keeping the torch of 9/11 Truth burning brightly as we continue the march to victory.